Broward County Sheriff Scott Israel was struck by a vehicle while jogging in Davie Tuesday evening. He spoke out Wednesday and thanked the community for their support. The incident happened near Southwest 42nd Court and Hiatus Road. BSO said the driver remained at the scene and Sheriff Israel was transported to the Cleveland Clinic with minor injuries. "As he almost cleared 42nd Court, the driver side mirror struck Scott Israel and then she ran over his foot," said Capt. Dale Engle with Davie Police. 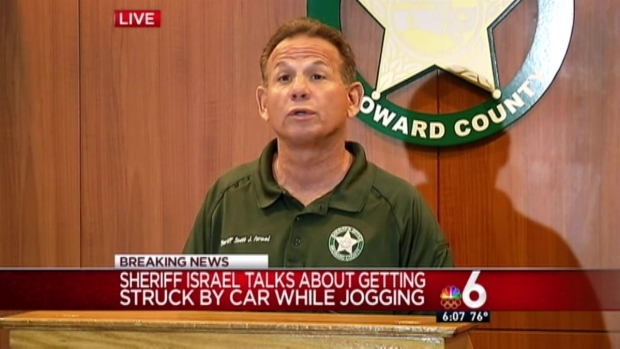 Broward County Sheriff Scott Israel was struck by a vehicle while jogging in Davie Tuesday evening. He spoke out about the accident Wednesday. He was later released from the hospital and held a press conference Wednesday afternoon, saying he's very "blessed" and "grateful" for the outcome of the accident. "A lot of people in America come to work and have a lot worse going on," Sheriff Israel said. Israel said he was struck in the elbow and landed on his wrist before the driver ran over his foot, breaking his toe. "A lady didn't see me and turned into me, and struck me," he explained. He also said his days of walking and jogging on streets are over. He will now only exercise in parks. One man who witnessed the incident said he helped the sheriff as the driver called 911. Broward County Sheriff Scott Israel was struck by a vehicle while jogging in Davie Tuesday evening. 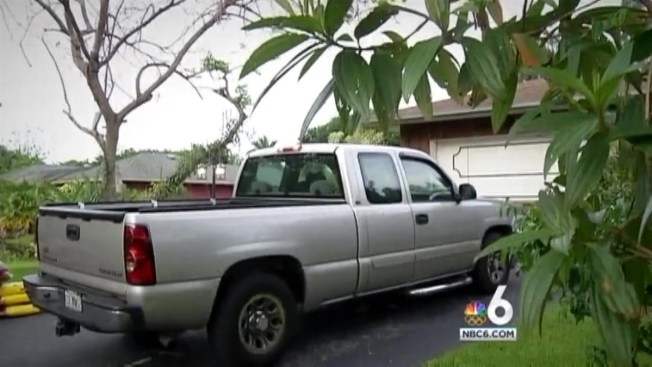 NBC 6's Sharon Lawson reports. "The guy looked at me and said, 'Lady, you didn't just hit a police officer, you hit the sheriff of Broward County," Sheriff Israel explained. "She was an incredibly nice woman. She stopped to render aid, asked me what I needed, called 911 right away. Stood by me the whole time. So I would like to just thank her." The sheriff also thanked the community for all the support and kind words, and said it'll be 4 to 6 weeks of recovery for his broken toe. "I look at this as the glass is half full. He had me covered and He just protected me because when that car came and as close as it was when I saw it coming, for me to be standing here and talking to people and released from the hospital last night, it just doesn't seem like that's the way this accident should have ended," Sheriff Israel expressed. The driver was charged with failure to use due care.